Note- RC currently does not support the new Bigcommerce API so if you are using the new API and you want to use RC then you will need to contact Bigcommerce and ask them to revert your account back to Legacy to proceed. Open a new browser window or tab and follow the instructions below to create the user. We will need to switch back and forth from Bigcommerce admin pages to Revenue Conduit admin pages, so keep both windows open. 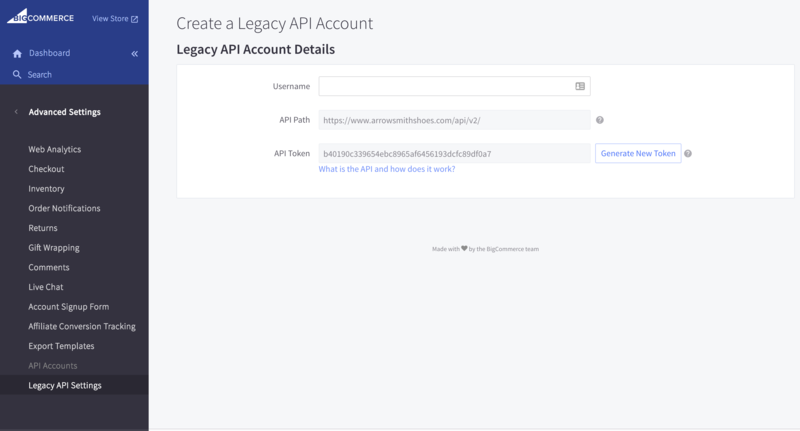 Select "Create a Legacy API Account"
Copy the Username field and paste into the "API User" field in Revenue Conduit. 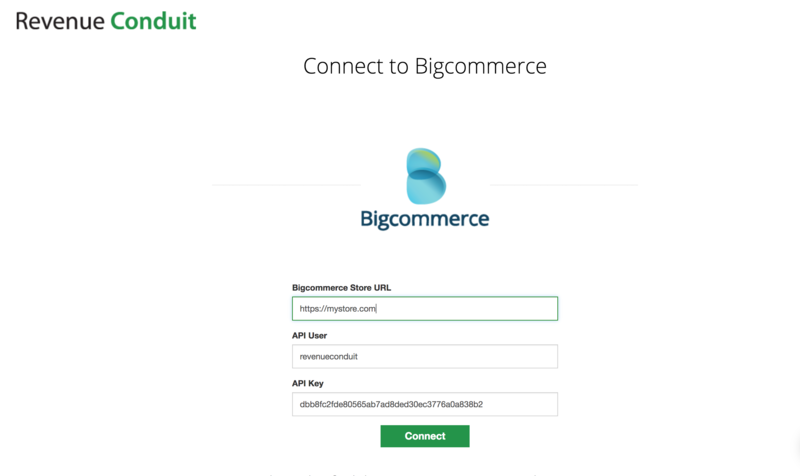 Copy the API path in BigCommerce and paste into the API URL section of Revenue Conduit minus the /api/v2/. Hubspot users only: You will need to complete this portion in order to enable tracking of your customers from your store in Hubspot, this only applies if you have the Marketing section of Hubspot. 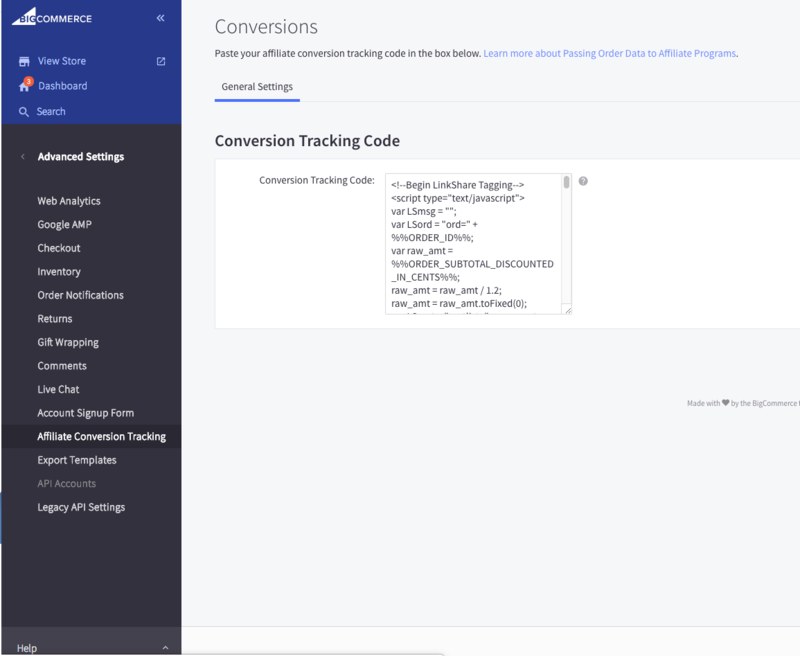 Add the RC Tracking Code (script 1) from the Revenue Conduit admin portal by clicking on your marketing platform> settings> and then scroll to section titled "Hubspot Setup" and copy code from under step 8 (this varies per customer). *****the steps in RC admin are outdated so only copy the code from step 8 if you are on version 2.0 but if you are not on version 2.0 in Bigcommerce then follow the steps in RC admin and disregard steps 1-4 from above. Log in to your HubSpot Account Dashboard. Go to Marketing> Lead Capture>Forms (if on on newer version) if you are on older version of Hubspot you would go directly to Contacts>Forms. 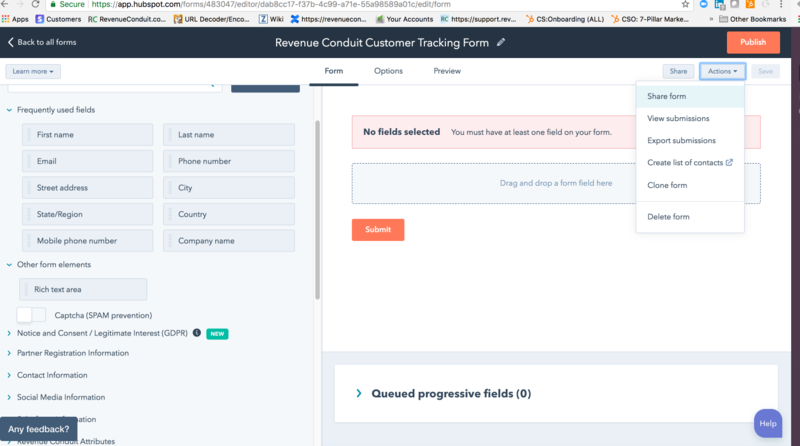 Find the Revenue Conduit Tracking form and click on it. 7. Click on "Script Manager"
8. Click on "Create a Script" button. 9. Add "Hubspot Tracking Code 1" to "Name of script". 10. Select "Head" for "Location on page". 11. Select "All pages" for "Select pages where script will be added". 12. 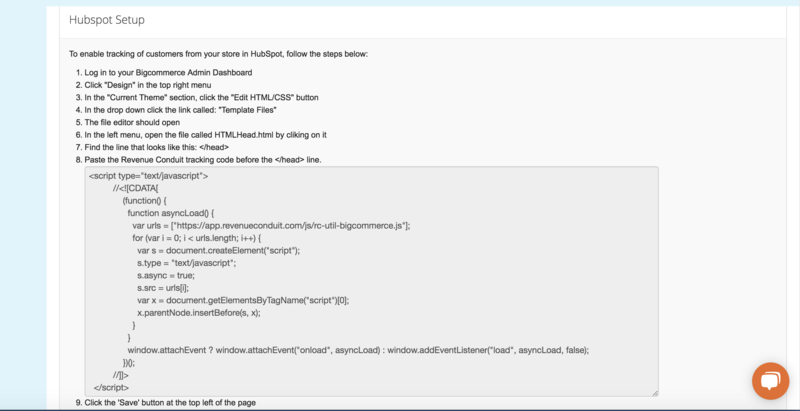 Select "Script" for "Script type from Hubspot. 13. Copy the first script from Hubspot starting with <script> Test Script </script> and paste into the script contents section. Click on "Create a Script" button. Add "Hubspot Reports & Analytics Tracking" to "Name of script". Select "Head" for "Location on page". Select "All pages" for "Select pages where script will be added". Select "Script" for "Script type from Hubspot. 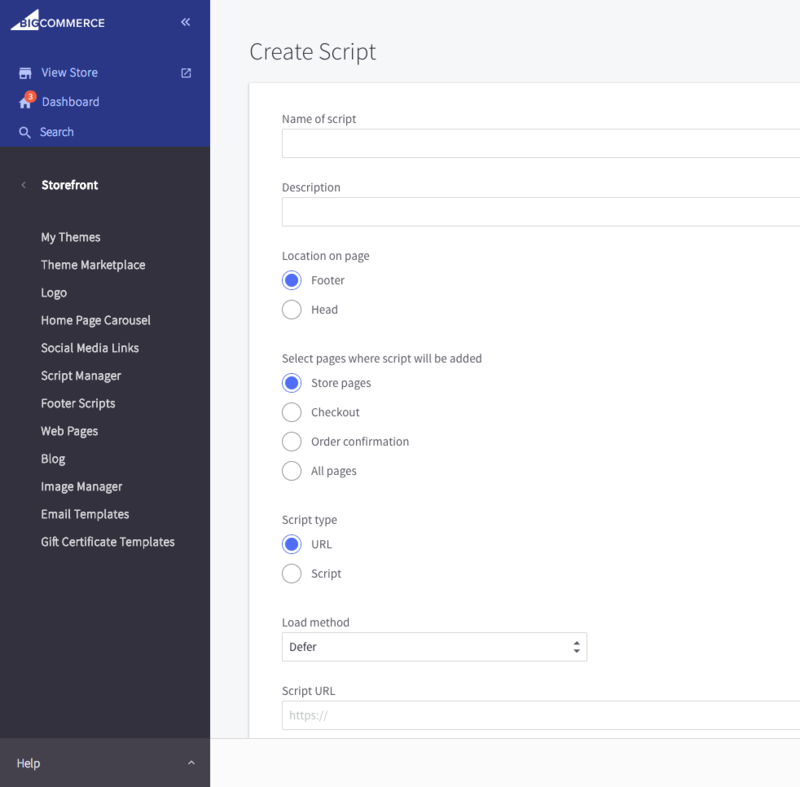 *****To verify if you have done this correctly, you will see a total of 3 tracking scripts in your BigCommerce store under the script manager once through the steps. For ActiveCampaign Users: This feature does not apply.